Your band teacher told you about his days as a Navy bandsman. A Navy band came to your school and blew you away. The gigs ran out and the rent was due. You wanted to serve your country. You opened a letter and read, "Greetings. You have seen selected by your friends and neighbors..."
We became Navy musicians for thousands of reasons. Whatever the reason, the experience helped shape our lives as musicians and citizens. Consider the life of this trumpet player, a World War Two bandsman who became an MU because he liked the little harp the musicians wore on their sleeves. Video produced by The National Visionary Leadership Project, "the premier resource for oral history interviews with African American elders who shaped the 20th century." I enjoy learning what other Navy Musicians Association members are up to during the year. 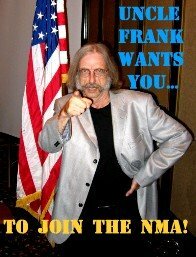 Our musical accomplishments are not all in the past; many of us are still musically active, performing in and leading community bands, college and school ensembles, professional big bands and jazz groups, touring acts--you name a style or venue, and you'll find NMA members on the bandstand. Many members will remember Max Murray, the new member who brought his electric upright bass and electric infectious enthusiasm to the reunion last year in Virginia Beach. The NMA reunion wasn't Max's only musical commitment last year. Here he is in a 2009 video, the bassist in the trio accompanying The Uptown Vocal Jazz Quartet. Click here for more clips of Max with the UVJQ. Due to another robo-spam attack, comments to NavyLyres now must verified by me. This simply means that your comments won't show up immediately. I'll have to verify each comment to ensure it's from a real human being. The last time this happened, I shut down comments completely. I don't like doing that; the fine, relevant contribution from Kenny Malone (on the story below) is an example of the reason I want everyone to feel free to leave responsible comments here. So it's business as usual with a slight delay.